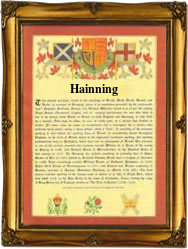 Recorded as Haining, Hainning, Haning, Hanning, and Henning, this is a Scottish surname. It is believed to originate from a place called 'The lands of Haynyng', thought to have been in the county of Dumfriesshire, where the name has some popularity. However it is quite possible that the name is locational as there are two places from which the name could have originated. These are Haining Castle in Stirlingshire, or The Haining, a village in Selkirk. Locational surnames are 'from' names. That is to say names given to people after they left their original village to move somewhere else. The easiest way to identify such strangers, was to call them by the name of the place from whence they came. Local accents being very thick, and spelling at best indifferent, lead to the development of alternative or variant spellings forms. In this case early examples of the surname recordings include William Hanynyg who held lands in the barony of of Halywode in 1630, and John Haining of Glenaber, who was confirmed as the heir to the estate of his father George, in 1655. The meaning of the place name iand hence the later surname is probably the 'fenced enclosure' from the pre 7th century Olde English word 'haegen', meaning a ring fence of thorn.